A panda cub slips off the stage at the Chengdu Research Base of Giant Panda Breeding on Sept. 29, 2016 in Chengdu, during a public debut of the year's 23 cubs born at the center. 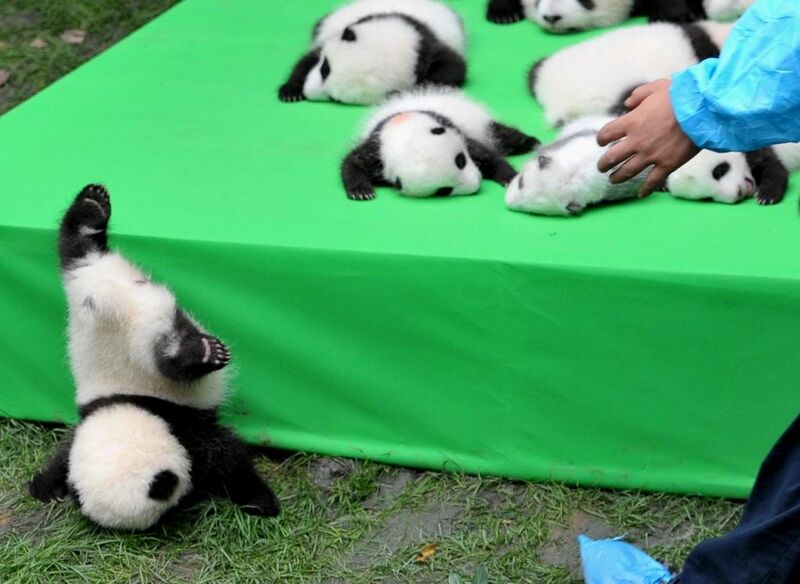 Roly-poly can be a plus for a giant panda tumbling around in the wild. But on stage with 22 of your cute-and-cuddly kin, the pudge can lead to a spill. And that's what happened during the public debut of 23 panda cubs that were born this year at the Chengdu Research Base of Giant Panda Breeding in China. As soon as the little furball took a nosedive off the low platform, a staff member scooped him or her up and placed the cub back on the stage. The pile of cuteness on display Thursday (Sept. 29) ranged in age from about 4 months to just 1 month old. In fact, on Sept. 4, conservationists announced that the panda population has increased enough to downgrade their "endangered" status to "vulnerable" on the IUCN's Red List of Threatened Species. Even though gains have been made to bolster panda numbers and health, the IUCN warned the pudgy animals still face threats from climate change and reduced bamboo availability linked to their habitat loss. The Panda Base opened in March 1987 and has since led the way in breeding, research and conservation of pandas, in cooperation with the Chengdu Zoo.